Is Bed Bath & Beyond a Value? 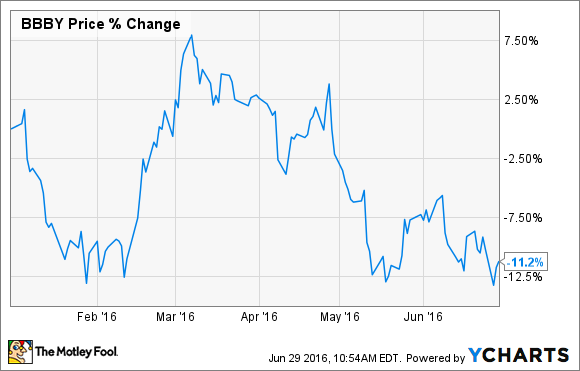 Is this beaten-down retailer cheap? Or is the low valuation a warning sign for investors? Bed Bath & Beyond (NASDAQ:BBBY) shares have been beaten up in 2016 and the earnings report on June 22 did nothing to buoy investor sentiment. Is it time to bet on a rebound, or is the business stuck in neutral? Let's take a look. A quality stock on the cheap? Because of the deteriorating share price, Bed Bath & Beyond stock appears to be inexpensive as measured by the price-to-earnings ratio. The share price relative to the last 12 months of profit currently sits at a meager 8.4. With other retailers' price-to-earnings valuations solidly in double digits, why such a low figure for Bed Bath & Beyond? Investors have not been encouraged by the company's performance. During 2015, the company reported a slim 1.7% total sales increase against a 12.1% profit drop. Things haven't improved much so far this year. In the first quarter, sales were flat and profit took another 23% hit from the same period last year. For the full year, revenue is expected to be flat and profit is expected to fall as much as another 10%. The company has been struggling to keep up with online retailers. While many physical retailers have struggled to keep foot traffic coming in the door, internet sales have seen 14% sales growth over the past couple of years. Profits have taken a hit as Bed Bath & Beyond makes heavy investments to update its online and mobile sales capability. While shares may appear cheap, the drop in valuation is fair as Bed Bath & Beyond tries to avoid falling into irrelevance. With elevated spending on updating technology expected to continue through the end of this year, investors may have to exercise further patience before things start looking up again. Despite the short-term headwinds, Bed Bath & Beyond feels confident about the future. Business operations include not just the Bed Bath & Beyond stores, but also buybuy BABY, Christmas Tree Shops, and the Cost Plus World Market chains. Management feels that cash flows will stay strong from its various home-goods businesses over the long term and authorized its first ever quarterly dividend in April. The dividend remains at $0.125 per share. The company has also taken steps to address issues, most notably building out its online business and working at increasing same-store sales. The company expects to spend $400 million to $425 million this year in updating its technology and building four new facilities to help with online order fulfillment. This represents half of what last year's net profit was and is likely to be roughly that amount this year as well. Bed Bath & Beyond also recently announced the purchase of small home furnishing and design company One Kings Lane, an internet retailer of furniture and other decor that offers complementary design services for its customers. In addition to its online presence, the company has two studios, located in New York and San Francisco. The hope is that the home-decor expertise of the team at One Kings Lane will help Bed Bath & Beyond expand its reach to clients looking for home goods, especially in the area of furniture for the home. I think the biggest win for Bed Bath & Beyond, however, is the ability to bring design services in-house and integrate those services with its online store. Though the headwinds for Bed Bath & Beyond are strong in the short run, the company looks to be taking steps to ensure its relevance in the future as the retail world shifts to a digital format. Is the stock a value? Share prices have dropped significantly, and the stock appears to be cheap. However, I think it is too soon to call Bed Bath & Beyond a value. The company has made great strides in updating its business model to accommodate the growing number of online transactions, but the company still has a long way to go to catch up to its competitors. Many online retailers have moved on from establishing an online store and are now battling over things such as faster delivery times. Bed Bath & Beyond, though, is still working to optimize its online platform and building the necessary infrastructure to accommodate online sales. The company has also stated that 2016 is scheduled to be the year that sees the peak in spending to build out and update its digital capabilities. As in years past, this spending will eat into profits, and management has predicted profits to fall again this year. Spending to update the business has also not helped sales to grow as of yet. The question remains as to whether the initiatives will push overall revenue higher, or if they will merely prevent the company from shrinking. Before calling Bed Bath & Beyond a value, I'm inclined to wait to see if this year's peak in spending is enough to move the needle and push sales and profits higher.